Thanks to the vast product portfolio of established players in the India nebulizers market, the growth of the said market is predicted to be promising, reports Transparency Market Research (TMR). In terms of competition, strong foothold of large players depicts a largely consolidated vendor landscape, with major share held by these large players. Furthermore, continual R&D by large players for new product development and introduction of novel products is likely to further consolidate the position of established players in the India nebulizers market. Key companies operating in the India nebulizers market include DeVilbiss Healthacre LLC, Omron Healthcare, Respirotech Med Solutions Pvt Ltd., PARI Respiratoty Equipment Inc., Medicare Equipment (India) Pvt. Ltd., Becton Dickinson & Company, Bhasin Sons Private Ltd., Philips Healthcare, CareFusion, and Agilent Technologies. According to the TMR report, the India nebulizers market is predicted to rise at a whopping 25.80% CAGR during 2015-2023, for the market to reach an opportunity of INR 4,703.4 mn by 2023-end. Product-wise, pneumatic nebulizers display the leading demand due to their compatibility with almost all types of medication. In 2014, pneumatic nebulizers held more than 68% of the overall market. 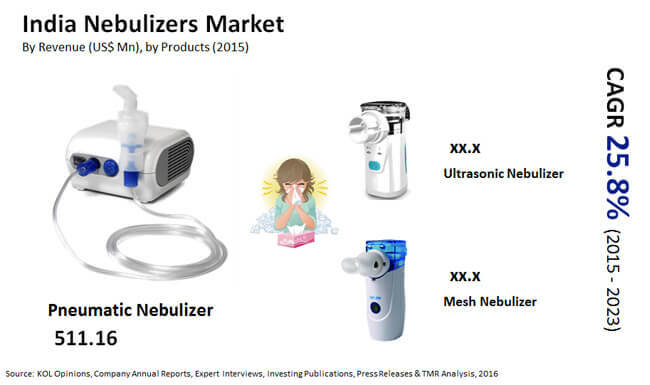 Mesh nebulizers, on the other hand, held the second-leading share in the overall market in the same year. Divided into four key zones, North zone held the leading share in the India nebulizers market in 2014. According to statistics by the World Health Organization, in India, deaths due to various lung disorders are on the rise. The numbers are alarming with every 142 deaths of 100,000 associated with some form of lung disorder. Due to such numbers, India stands first worldwide for deaths associated with lung diseases. The rising incidence of acute respiratory diseases, including cystic fibrosis, chronic pulmonary diseases and asthma are driving the India nebulizers market. Nebulizers are the first clinical action for patients of asthma or COPD in the event of an attack. Nebulizers are used to administer medication in mist form inhaled into the lungs. Nebulizers use oxygen, ultrasonic power, or compressed air to disinegrate solutions and suspensions into small aerosol droplets. These droplets can be directly inhaled from the mouthpiece of the instrument. The high pollution level in most parts of the country, especially urban areas is a key factor behind lung disorders. Soaring number of vehicles, expansion of industries, and deforestation are some prime factors for rising pollution. The high particulate matter in air results in low oxygen content in air that is inhaled. Over a period, lack of oxygen and high level of carbon and hydrogen inhaled through air results in reduced lung capacity. This, in turn leads to use of external instrument such as nebulizer to help with breathing. This is pushing the growth of India nebulizers market. In some regions, such as the East zone of India, the demand for nebulizers surpasses than that in other parts of the country. According to statistics of Department of Environment in West Bengal, 70% of people in Kolkata are afflicted with some form of respiratory conditions. High air pollution due to unchecked emissions by vehicles and massive construction projects are mainly responsible for high air pollution in cities in West Bengal. This has led to the severe occurrence of respiratory diseases that need to be controlled using nebulizers. Thus, the India nebulizers market witnesses growth.